Nanocomposites of ferroelectric-/-magnetic oxides, solid oxide fuel cells (SOFC), metals containing nano-carbon structures called Covetics; 4H SiC based MOSFETS for high temperature, high power applications, transmission electron microscopy of semiconductor nanowires, optical properties of materials, hybrid phtovoltaic nanocompostites. Dr. Salamanca-Riba's research is in the areas of self-assembly of semiconductor nanowires and liquid crystal nanocomposites for hybrid photovoltaic applications, DNA-based biosensors and radiation sensors on GaAs, and materials with high C content in the form of nanocarbon called “covetics,” wide band gap semiconductors (4H SiC) for high power, high temperature electronics. 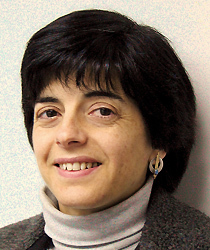 Dr. Salamanca-Riba’s research involves the use of the transmission electron microscopes and the atomic force microscope at the Advanced Imaging and Microscopy (AIM) Laboratory. The project on covetics involves the understanding of the role of nanocarbon on the structure and properties of metals. The incorporation of C enhances several properties of the host metal, such as, the thermal and electrical conductivity, the oxidation and corrosion resistance and the yield strength. Covetics can be deposited as thin films and used as contacts in photovoltaics and other electronic applications. This work is in collaboration with Argonne National Laboratory and DGC Industries. In collaboration with the Army Research Laboratory, Auburn University and Rutgers University, Dr. Salamanca-Riba’s project on 4H SiC MOSFETs consists of the investigation and analysis of electron energy loss spectra (EELS) across the interface between the 4H SiC substrate and the SiO2 oxide layer for samples with different oxidation process and post oxidation treatments. Analysis of the EELS spectrum imaging maps is carried out using principal component analysis. Her project on DNA attached to GaAs aims at understanding the anchoring mechanism between thiolated DNA and GaAs that gives rise to arrays of single stranded DNA molecules oriented normal to the surface of GaAs. These structures could be used for the fabrication of biosensors and radiation sensors. Dr. Salamanca-Riba’s has an additional project focusing on the growth and characterization of semiconductor nanowire arrays of ZnO for the fabrication of light emitting devices. The nanowires are combined with liquid crystals for applications as hybrid photovoltaics in which the liquid crystal is the whole conductor and the ZnO the electron conductor. These solar cells are expected to have higher efficiencies than all organic solar cells and be less expensive to produce than all inorganic solar cells. This course emphasizes fundamental aspects of zero-, one- and two-dimensional defects in materials. The thermodynamic equilibrium of point defects in different oxide materials and their effect on the physical properties of the material are discussed. Dislocation-dislocation and dislocation-point defect interactions, dislocations in different crystals and roles of dislocations in deformation, twinning, and phase transformation are also discussed. The effects of dislocations and other defects on the electrical, optical, thermal and mechanical properties of materials are discussed. This course covers the basic principles of electron microscopy theory, electron diffraction, and imaging theory. The electron beam sample interaction that gives rise to different signals is related to the structural and compositional information that is obtained from a sample using a TEM. The most common TEM techniques for structural characterization of a sample, namely, electron diffraction, bright/dark field imaging, and high resolution lattice imaging are discussed. Compositional information obtained from x-ray fluorescence and electron energy loss as well as the resolution of these techniques is also covered. A description of techniques used to study magnetic materials is also presented. to obtain energy dispersive X-ray spectra and maps in TEM and STEM modes. “Long-Term Cr Poisoning Effect on LSCF-GDC Composite Cathodes Sintered at Different Temperatures,” Chunyan Xiong, Joshua A. Taillon, Christopher Pellegrinelli, Yi-Lin Huang, Lourdes G. Salamanca-Riba, Bo Chi, Li Jian, Jian Pu, and Eric D. Wachsman, Journal of The Electrochemical Society, 163 (9) F1091-F1099 (2016). “Sp2 Carbon Embedded in Al-6061 and Al-7075 Alloys in the Form of Crystalline Graphene Nanoribbons,” H. M. Iftekhar Jaim, Romaine A. Isaacs, Sergey N. Rashkeev, Maija Kuklja, Daniel P. Cole, Melburne C. LeMieux, I. Jasiuk, S. Nilufar, and Lourdes G. Salamanca-Riba, Carbon, 107, 56-66 (2016). “Magnetization Reversal in Epitaxial Highly anisotropic CoFe2O4 Hetero-Structures,” A. Lisfi, S. Pokharel, W. Morgan, L. Salamanca-Riba, and M. Wuttig, J. of Applied Physics 117, 17B727-1 -4 (2015). “Synthetic Crystals of Silver with Carbon; 3-D Epitaxy of Carbon Nanostructures in the Silver Lattice,” Lourdes G. Salamanca-Riba, Romaine A. Isaacs, Melburne C. LeMieux, Jiayu Wan, Karen Gaskell, Yeping Jiang, Manfred Wuttig, Azzam N. Mansour, Sergey N. Rashkeev, Maija M. Kuklja, Peter Y. Zavalij, Jaime R. Santiago, and Liangbing Hu, Adv. Funct. Mater. 25, 4768–4777 (2015). “Nanocarbon - Copper Thin Film as Transparent Electrode,” R.A. Isaacs, H. Zhu, Colin Preston, A. Mansour, M. LeMieux, P.Y. Zavalij, L. Hu, and L.G. Salamanca-Riba, Appl. Phys. Lett. 106, 93108-1-5 (2015). “Three Dimensional Microstructural Characterization of Cathode Degradation in SOFCs Using Focused Ion Beam and SEM,” J. Taillon, C. Pellegrinelli, Y. Huang, E. Wachsman, and L. Salamanca-Riba, ECS Transactions 61, 109 (2014). “Physical and Mechanical Characterization of a Nanocarbon Infused Aluminum-Matrix Composite,” Lloyd Brown, Peter Joyce, David Forrest, and Lourdes Salamanca-Riba, Materials Performance and Characterization, 3, 65–80 (2014). “In-situ Elevated Temperature Transmission Electron Microscopy of Sensitized Aluminum-Magnesium Alloy Treated by Ultrasonic Impact Treatment” Kim N. Tran, Wen-An Chiou, and Lourdes Salamanca-Riba, J. Mater. Res. 29, 1456-62 (2014). “ZnO Nanorod-Smectic Liquid Crystal Composites: Role of ZnO Particle Size, Shape and Concentration on Liquid Crystal Order and Current – Voltage Properties,” J. Branch, R. Thompson, J. W Taylor, L. Salamanca-Riba and L. J. Martínez-Miranda, Appl. Phys. Lett. 115, 164313-1 -- 5 (2014). “Microstructural Evolution of Severely Plastically Deformed Sensitized Aluminum 5456-H116 Treated by Ultrasonic Impact Treatment,” K. Tran and L. Salamanca-Riba, Adv. Eng. Materials, 15, 1105 -1110 (2013). “Systematic structural and chemical characterization of the transition layer at the interface of NO-annealed 4H-SiC/SiO2 metal-oxide-semiconductor field-effect transistors,” Joshua A. Taillon, Joon Hyuk Yang, Claude A. Ahyi, John Rozen, John R. Williams, Leonard C. Feldman, Tsvetanka S. Zheleva, Aivars J. Lelis, and Lourdes G. Salamanca-Riba, J. Appl. Phys. 113, 044517-1 -6 (2013). MSE researchers explore full scale characterization in new hybrid material. Award supports study of silicon carbide for use in efficient, high-powered electronics. Novel study demonstrates possibility of cheaper, flexible solar cells.